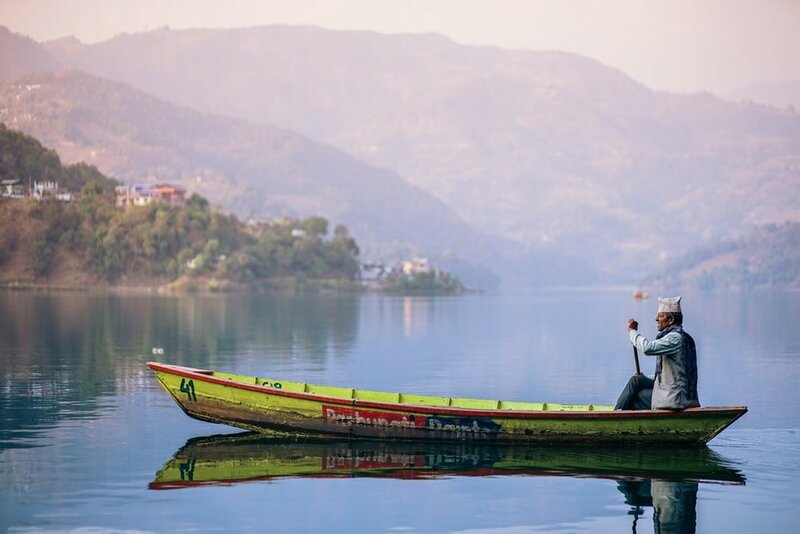 Nepal is a country of a distinctive natural and cultural climate, with both its nature and unique culture being sought after by hundreds of thousands of tourists every year. With the gorgeous Himalaya mountain range as a backdrop, Nepal, whilst remaining one of the poorest countries in the world, is undoubtedly rich in incredible scenery and the ancient heritage it implies. The Shah Dynasty ruled over Nepal throughout the 19th and 20th century in a period when Nepal was struggling to move towards Democracy. The country was in civil strife until 2008, when a peace treaty was signed and elections held; Nepal is henceforth known as the Federal Democratic Republic of Nepal. The most spoken language in Nepal is Nepali followed by several other ethnic languages. The multi-dimensional heritage of Nepal is formed of numerous different ethnic, tribal and social groups; most notably Indian, Mongolian and Tibetan. The Nepalese flag is the only flag that is not quadrilateral in shape. It is formed of two triangles representing Buddhism and Hinduism (and the Himalayan mountains). "Namaste" is the standard greeting in Nepal. It literally translates to "I salute the God in you" but can be used to say hello, goodbye, and thank you. Cows are sacred in the Hindu religion and cannot be killed. Cows roam all over Nepal, even in the busy city of Kathmandu. The ancient trade route passing between Tibet and India is what facilitated the rich and uninterrupted culture of Kathmandu. The increased settlement of mixed ethnicities within Kathmandu led to the amalgamation of artistic and architectural traditions, which is what makes the capital so unique! You won't be short-changed in terms of entertainment in Kathmandu. Check out Sam's blog here for some ideas of what to do when you get some free time in the capital. Or check out Lucy's more food-focussed blog here. Kathmandu has one of the slowest internet speeds of all the world's capital cities at 256 kb/s. The city was once known as "Kantipur", translating to "City of Glory". The region boasts the densest number of UNESCO World Heritage Sites. Within a radius of 15km you will be able to visit six sites. Until very recently, the entire Everest region was completely off the phone signal grid. Thankfully, there is now WiFi and mobile data available at each camp all the way up to Gorak Shep (your last stop before Base Camp). You'll even have the opportunity to charge your mobile devices at each camp, for a small fee. There are some absolutely stunning views along the trekking trail. Be sure to bring a camera of some sort and a spare SD card or equivalent as you won't want to miss out on constantly reminding your instagram followers you trekked through the Himalayas (seriously). Cuisine will be provided by the teahouses and along the trekking route, with mostly high-calorie, hot food on offer to keep you energised for the duration of the trek. Special dietary requirements will be catered for as long as Choose A Challenge have been informed in advance. Along the trekking route, you will be housed in simple yet homely teahouses, in a multi-share room system. As with most outbound trekking, the cleaning facilities are limited. Daily showering is certainly a luxury in the Himalayan mountains! People of the Khumbu region are known as Sherpas, who are generally extremely skilled at climbing and have been conditioning to the altitude for generations. Climate is extreme around the Himalayas and is subject to change in a matter of minutes. The best ways to cope with altitude conditions are drinking purified water and taking your time climbing, allowing for a slow but steady acclimitisation process.